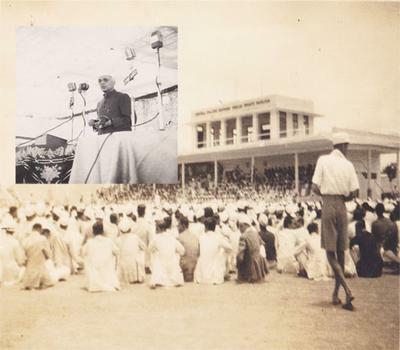 Nehru and his commited followers. 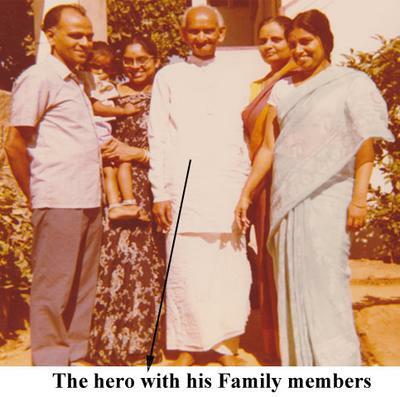 The Hero with his Family. The Hero and his spouse. Time and Place, more often than not, play a pivotal role in a person's life. Time and Place offer people unique opportunities. They throw light on the path of life one can take or give someone courage to take the untrodden path. I recall a hero whose life was totally influenced by time and place. The Hero's story begins in the previous century in a small town near Nandi Hills. He was in his thirties during the ‘40s. At that Time our Nation was still struggling for freedom. His town was filled with people, who were participating in various movements and ‘Non-violent harthals’. The Place was echoing the Mantra ‘Burn Videshi, wear Swadeshi'. Naturally the Good Samaritan involved himself in all those activities. He was a Lawyer in a Magistrate's court. He was made to quit his profession for participating in the ‘ Quit India’ Movement. At that point of time he thought that was a small price to pay for the freedom of the country. He was imprisoned a couple of times with other likeminded people. So what? The cause was laudable. People in the (prison) cell had similar wavelengths. His mission in the prime of his life was to get freedom for his country. Mahatma Gandhi, Jawaharlal Nehru and their followers and millions of fellow sufferers, made that possible. The country became finally independent. Our Hindu Scriptures say that one has to clear the debt to the mother and Mother Earth during the span of one's life. Our Hero conscientiously cleared both dues. His mother was too reticent to acknowledge it. Mother Earth was however more graceful. She recognized his efforts slowly but surely. He became a Thamra Pathra awardee after a decade or two. He was considered for ‘Political Sufferers Pension’. His name was also on the invitee's list for Independence Day celebrations and other public functions held now and then at the Raj Bhavan. What more could he expect? ' Power ' to control the state or the country? No, he was not cut out to be a politician. He could neither put self before the country nor plead for favors for himself or others. What next? The Hero, the head of the Family, took stock of the situation at his home front. It was high time that he narrowed down his focus on his home and his children. They needed to be educated, at basic and college levels. Without much deliberation he decided on his second mission. He wanted to make his children 'independent' too. He looked around. No! The place (village) in which he had proudly lived so far did not offer growth opportunities for his children. Time had come to uproot himself and go to a place, from where he could achieve what he wanted. The shift was important and imminent. was an unplanned move, with little capital, and lot of courage. He meant to educate all his children alike sans gender-bias, making his contemporaries wrinkle their noses or raise their eyebrows. In the big city, the Hero became just another citizen. The lawyer became a trader. He traded clothes and coconuts. He later became a realtor to realize his mission. City life was not a cakewalk. What he became was not the issue, what his issues would become, was his concern. This may sound like an extract from a brochure of an International Academy, the likes of which we see sprouting in every nook and corner of the city today. But, half a century ago, this was the type of holistic education our Hero aspired for his children. They were however; given the freedom to pursue any hobby they chose, during the academic year or between semesters. He used to be with them at any time, any place, encouraging them in word and deed. Both his body and mind were all the time involved in achieving his missions. Time took a toll on his body. He survived a stroke. After a month of being confined to his bed and a couple of months of house arrest, he was up and about taking care of his chores again. Little later he got jaundice. Yet, he never saw the world through jaundiced eyes. The occasional bouts of blues were diagnosed as ARP (Age Related Problems). His indomitable spirit helped him to ward off any crisis he had to face due to inimitable ways ‘place and time’ were playing in his life. To achieve his second mission, it took three and half decades. By this time, he was eighty. He chose a favorite place at home, sat on the easy chair, watched his country and children, listened to the Epics, and heard anecdotes narrated by his children. He and his fellow men had put their hearts and hands together to achieve the first Mission. He was not alone in the second mission either. His spouse was always behind him, like a shadow. Without ever overshadowing him, she supported him in all his endeavors, at all times and in all places. Her serenity and equanimity were unparallel. Even today, 24 years after his time, I recall every thing he took over on himself to achieve his missions. 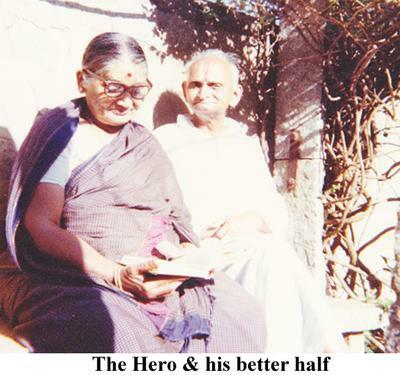 My Hero, Mr.Sampathkumar,(APPA), made me proud. Sringaramma (AMMA) was his source of strength. Both of them hand in hand brought us up and made us what we are today. Regardless of time and place I cherish their thoughts and deeds. A very moving and emotional tribute to a father.It is also a tribute to countless number of fathers who gave up there all for the freedom of the country and stayed anonymous after the country was freed from the foreign yoke. Thanks for your feedback. You are right. It is indeed a tribute to all the people who fought for the freedom of our country. We seldom think of their toil and turmoil and we take many things for granted. Pushpa,As children we had seen our people in the grip of swaraj fever, and deifying Gandhi and Nehru. But none dared to sacrifice their career,court arrest, and become blind followers of those leaders. Your father has been a martyr! And your mother?Will we see the like of her now? I hope the younger generation will come across such articles to get a clear picture of the those days of freedom struggle. Your reactions to my write-up is very warm and touching. Thanks a lot. As you have rightly observed, during the pre-independence period, there were people who fought, and there were people who had to obey the rulers and suffer silently or put up with pain, the atrocities of the higher ups who had power. Our Parents belonged to the first category. We consider ourselves blessed to have such parents. I am regularly reading your poems and shorts tories on the IWW web site and I find them interesting. It is a beautifully written article which is very moving and inspiring. Though our generation can never get a feel of how challenging times were during those days, reading about those days definitely serves as an eye-opener for our likes. A very well written article highlighting the admirable sacrifices made by your illustrious father. I thoroughly enjoyed reading it. Looking forward to more, well done. A touching tribute to a father. Hats off to a man with such progressive thinking in an era where there was a distict divide between males and females in terms of what they could learn/do and even think! Laudable was his committment to the country and family. great writing. Thanks Mr.Rajesh, for your comments. My father was a progressive thinker, and my mother never lagged behind. We siblings are blessed to have them as our parents. In many ways, your comments made me live vicariously through you as the American (English) saying goes. I mean, in ways, I imagined how it would be to be a daughter of parents whom were in their 20s/30s during critical times of a nation. As a Black American, the 1950s/1960s proved to be a volatile, yet provoking time in the USA. Perhaps our leaders took a glimpse of light from folks like your father; took that glimpse as a beacon of how to fight and press forward in the face of uncertatinty. Thank God for the mission of our parents, especially yours -- whom I've just had the unique pleasure to learn about. They'd be proud of their daughter; mission accomplished. I really appreciate your command over language which is impeccable. The narration and flow being exquisite. This blog has definitely inspired me to pen my thoughts as well. Thanks Chaaya, for your comments. I am happy you liked it.